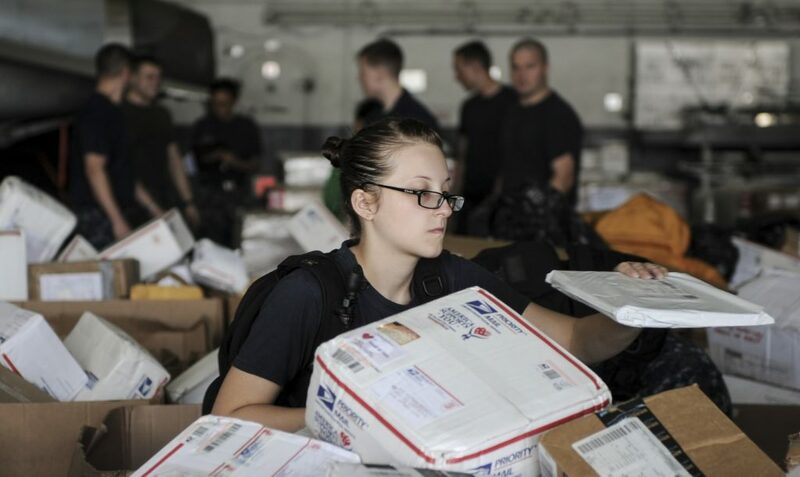 When items arrive at the warehouse from suppliers, we need to know the correlating PO’s number to check the arrived goods and put them away inside warehouse. 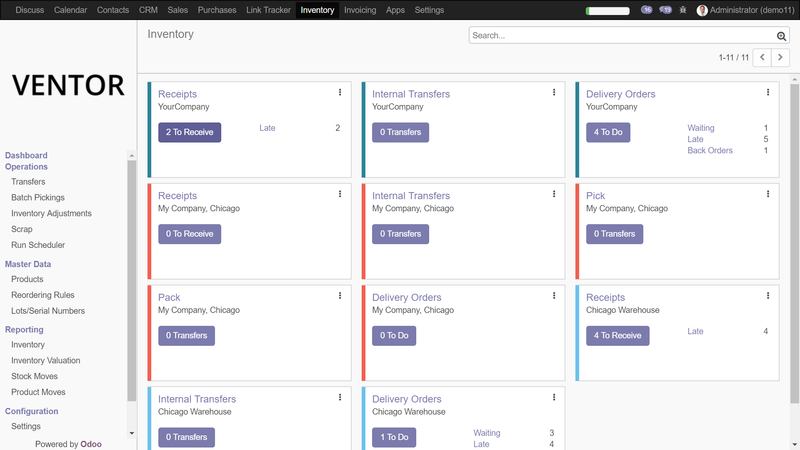 Let’s start from the Odoo dashboard. 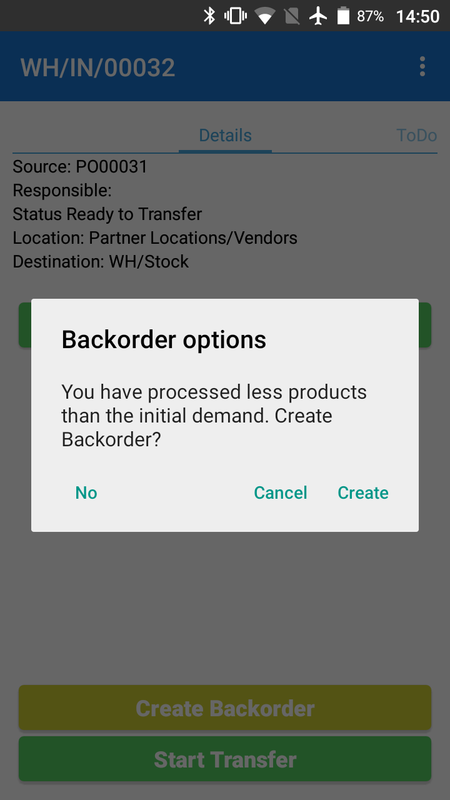 Open your Odoo ERP > Inventory App > Receipts. There you will find all the transfers you will process to receive items from different suppliers. 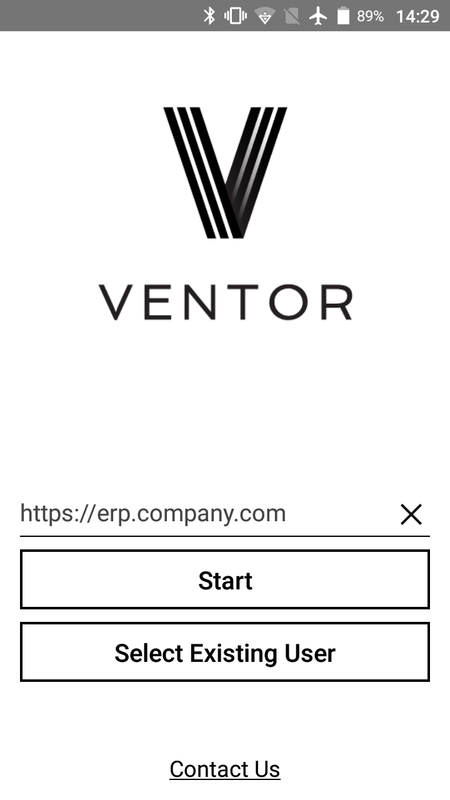 At this stage, you can compare the Odoo interface with the mobile interface of Ventor. 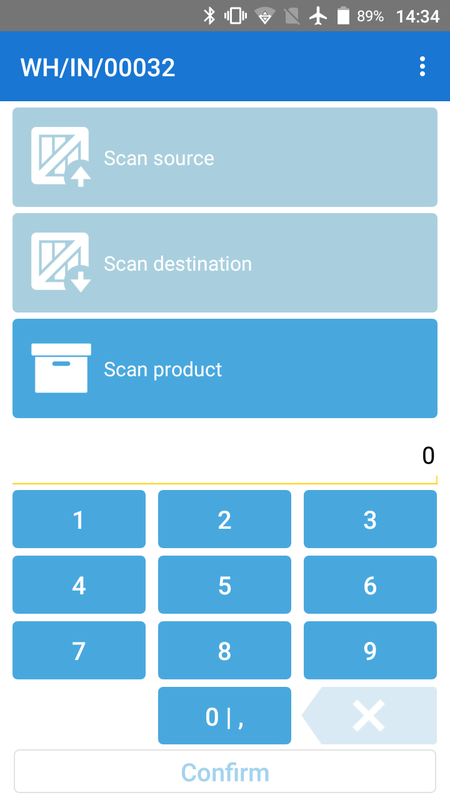 Open your Ventor app on your mobile phone or android barcode scanner (check out a full list of supported devices here). Use the “Odoo SAAS Login” button for logging with your Odoo account. Click on the “Contact Us” button to drop us an email. 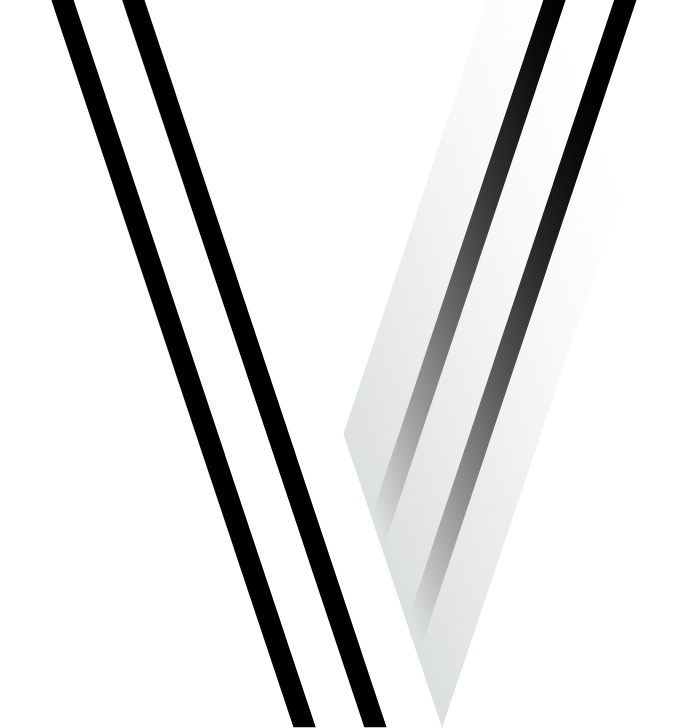 After successful connection, you will see the main menu of the app. 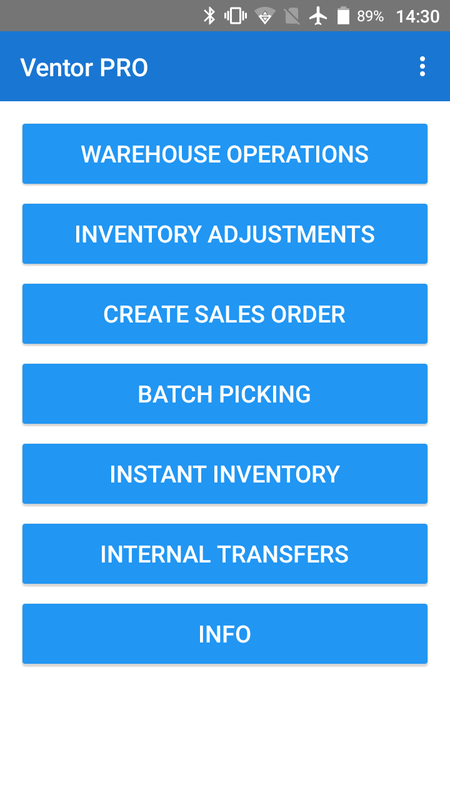 The warehouse operations menu is a full version of the Odoo Inventory Dashboard. 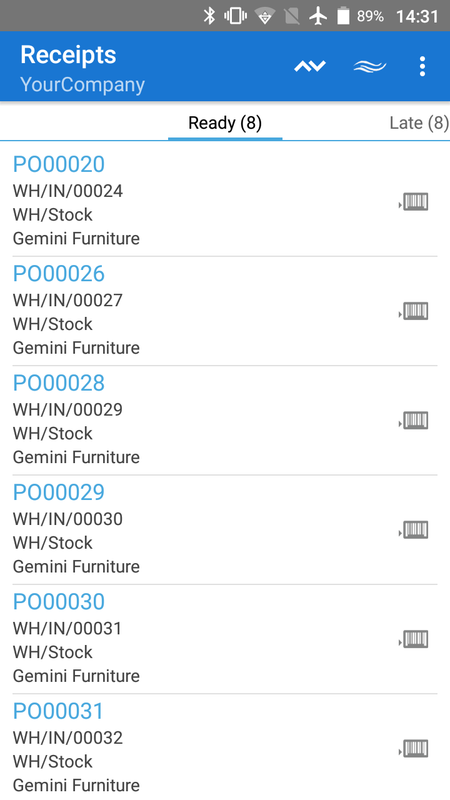 The dashboard shows all warehouses and their operation types (i.e., zones such as Input, Picking, Packing, etc). 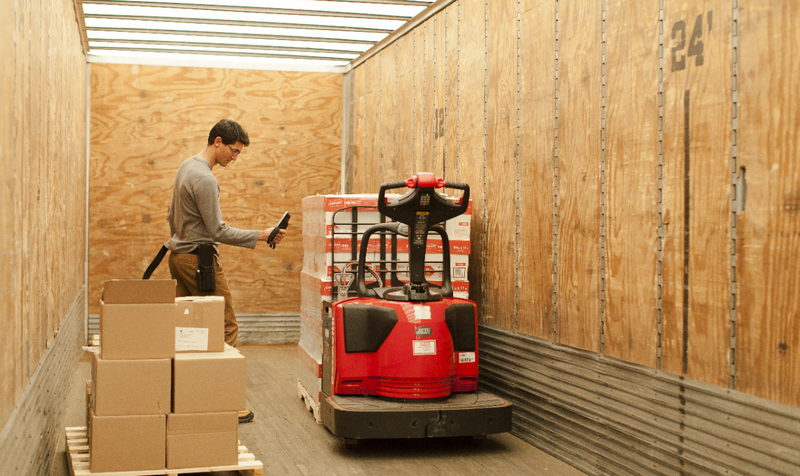 In most cases, you have one warehouse and three zones: Receipts (to receive items in stock), Delivery Orders (to dispatch items from stock) and Internal Transfers (for internal movements), as the default configuration. 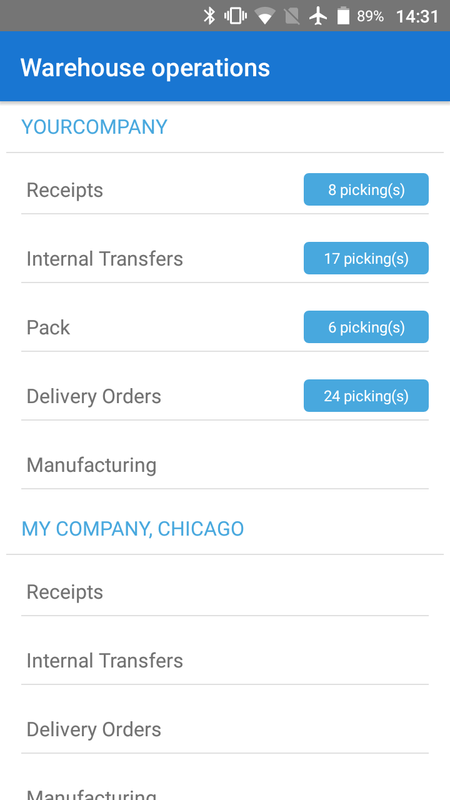 Click on “Receipts” to see all the available transfers linked to particular purchase orders. There you will see a list of transfers showing PO numbers, transfer numbers, supplier names and destination locations. You can also use search to find a specific transfer. Click on any transfer to start the receiving process. Each zone (receiving, delivery, etc.) has its own settings. Go to the particular zone and open settings by clicking on the three dots at the upper right-hand corner. 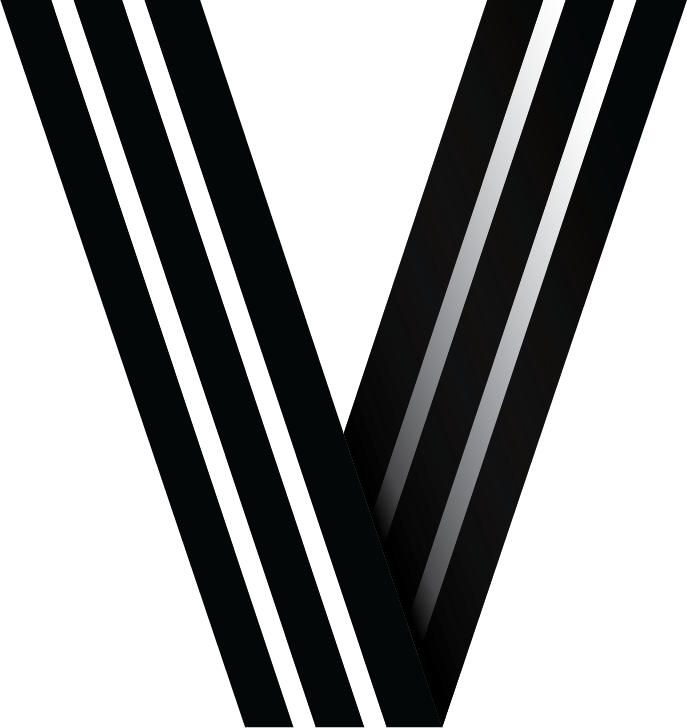 Allows a forced validation to be made by using additional scanning of each field. This function is not activated by default but can be configured for each operational type. Suggests where to pick the next product from the picking list. 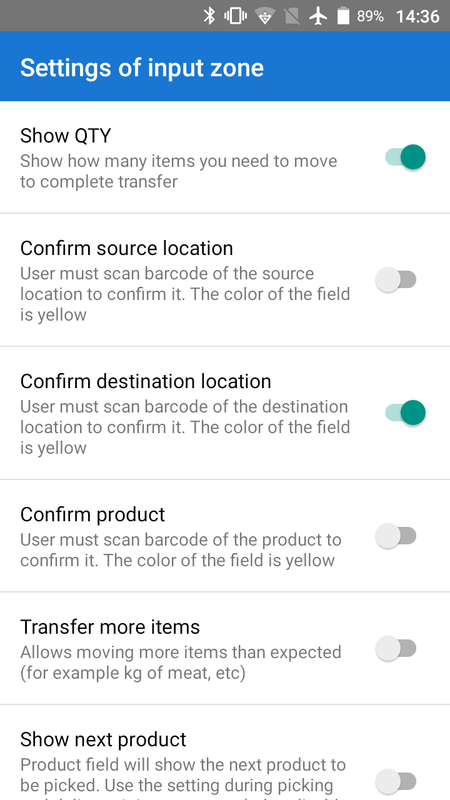 This feature is not activated by default and is usually not active at the receipt zone but active on any other zone to help the picker see the next produсt and a location where the items are located. 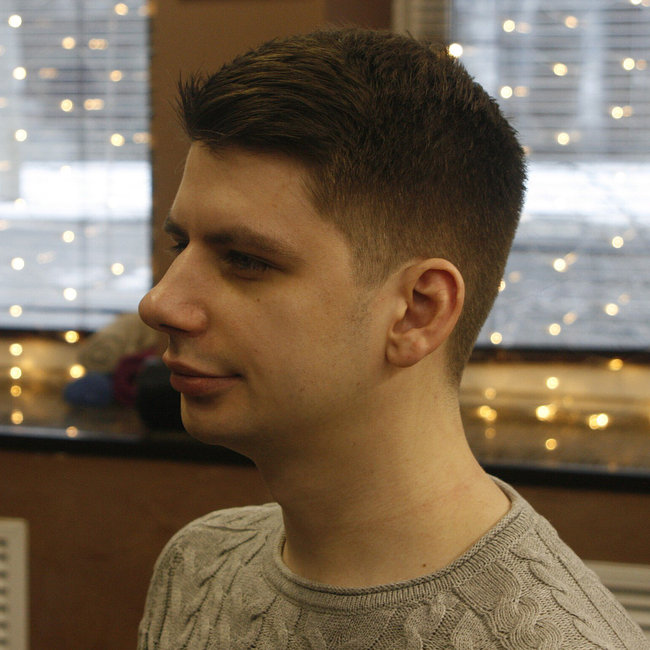 The picking process has become straightforward and simple for a picker of any experience level. 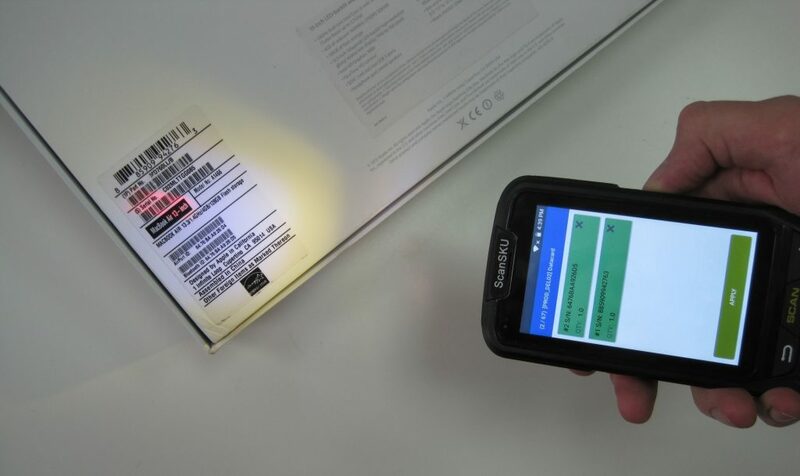 Now you know how to receive items from your vendor using a barcode mobile computer and the Ventor app. 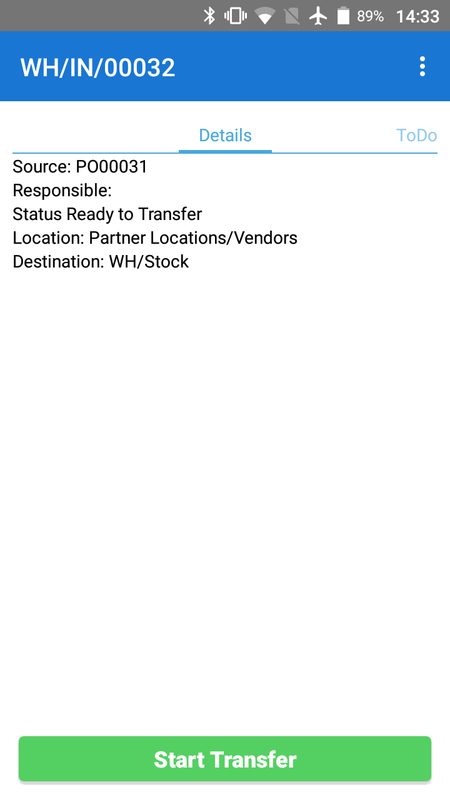 Using the app allows you to easily receive items and have full traceability of incoming goods in your warehouse, even without Odoo web interface interaction. 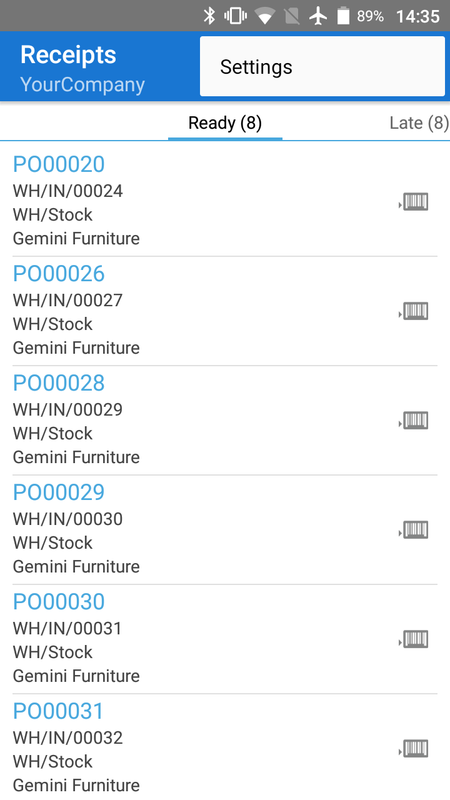 Feel free to leave your comments about inventory management in Odoo below. 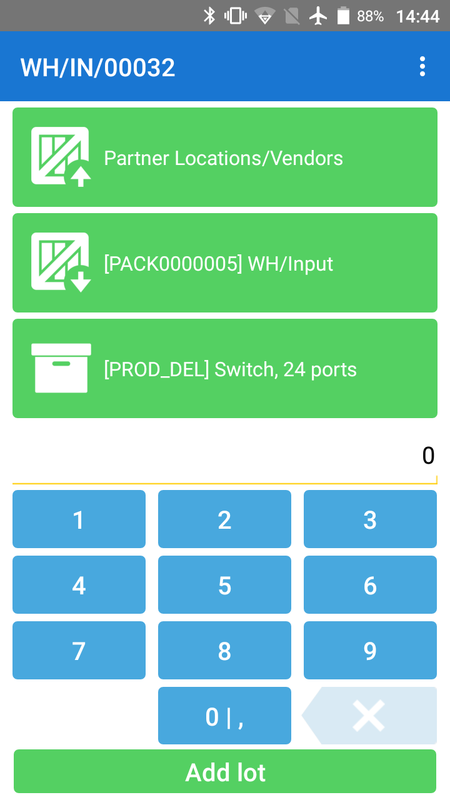 You also can test the app on your Odoo instance (Odoo v8-v11) here.